I love the first three books in the series. They have such complex layers in them, are very well-written, and have engaging characters. Each aspect of the world is rich with detail, even when the scene is only passing over a specific aspect. I can see and feel the world, and the fact that Clare is expanding it is exciting! That is the thing about series; they are great because you get more about your favorite characters, but then they make you cry when it's over (just like I experienced with Harry Potter). But I'm grateful that Clare is extending it. 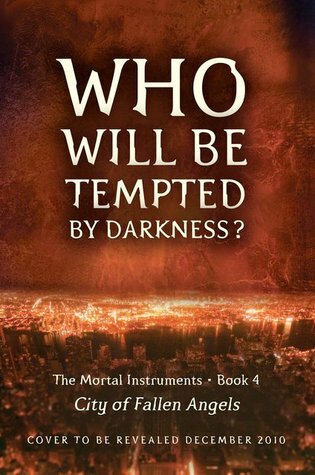 I'm especially glad that Simon, one of the supporting characters in City of Bones, City of Ashes, & City of Glass (The Mortal Instruments series), is being brought into the protagonist role. I really love his character; he is so strong and his loyalty to Clary really shined in the first three. I always felt he kept getting the shaft a tiny bit, but it did allow the main story arc to shine in the first three. Now I'll get to see him more. I'm really interested in seeing how the relationships between each of the characters develops: Jace and Clary, Alec and Magnus, Simon and Maia and Isabelle (Yes like it said above, he's juggling two girls). 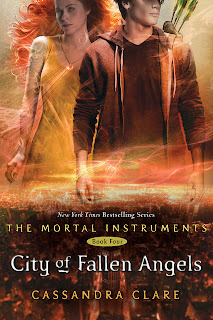 The story arc in this next set of three books (City of Fallen Angels, City of Lost Souls, & City of Heavenly Fire) is set to be an epic battle, one pitting Heaven and Hell against each other, and I can't be more excited!!! I feel like this has been building since City of Bones, and there is still so many questions I'd liked answered. In addition to this continuation, Clare's "prequel" to The Mortal Instruments, Clockwork Angels, also creates some questions which I believe will be explored. Anyway, I've babbled on way too long for a WoW post. So just do me a favor: run out and buy The Mortal Instrument series and Clockwork Angel. You won't regret it!